Rain was late in arriving this fall, but since it began, in mid-November, it’s been falling at pretty regular intervals. This week’s storms, which brought over 14 inches of rain in just three days to Mining Ridge, above Big Creek, finally resulted in significant runoff into the languishing south county reservoirs. This is good news because these reservoirs have to release enormous amounts of water (about 1,000 acre feet per day) during the summer and fall, if they are to succeed in slowing sea water intrusion in the lower Salinas Valley. The San Antonio River, which had remained bone dry well into this month, peaked at over 7,000 cubic feet per second (cfs) Thursday morning. About 9,000 acre feet have been added to storage in Lake San Antonio since the 13th, raising the lake from 13 to 16% of capacity. The more reliable Nacimiento River peaked at over 20,000 cfs, adding nearly 50,000 acre feet to storage in Lake Nacimiento during this same period. The lake has risen more than 20 feet and gone from 16 to 29% of capacity. Healthy numbers, but more storms will be needed since flows drop off steeply once the rain stops. The Nacimiento is already (Friday afternoon) at 1,230 cfs and declining rapidly. The Arroyo Seco River peaked at around 15,000 cfs, most of which has already dropped into the Salinas Valley’s parched aquifers. Only a little over 1,000 cfs has so far made it down the Salinas River as far as Spreckels. The Big Sur River which, for comparison, peaked at over 7,000 cfs, in 2017, reached only around 2,500 cfs Thursday morning. The Carmel River reached 7,000 cfs at Rosie’s Bridge, in the Carmel Valley Village, but the peak at the lagoon was less than 5,000 cfs, as the aquifer, depleted by pumping for domestic consumption on the Monterey Peninsula, soaked up the rest. It’s a good start, but much more is needed. Some light rain is possible on Sunday, but after that a “highly amplified upper level ridge” is expected to build over the eastern Pacific, slamming the door on additional precipitation; probably until at least the first week of February. 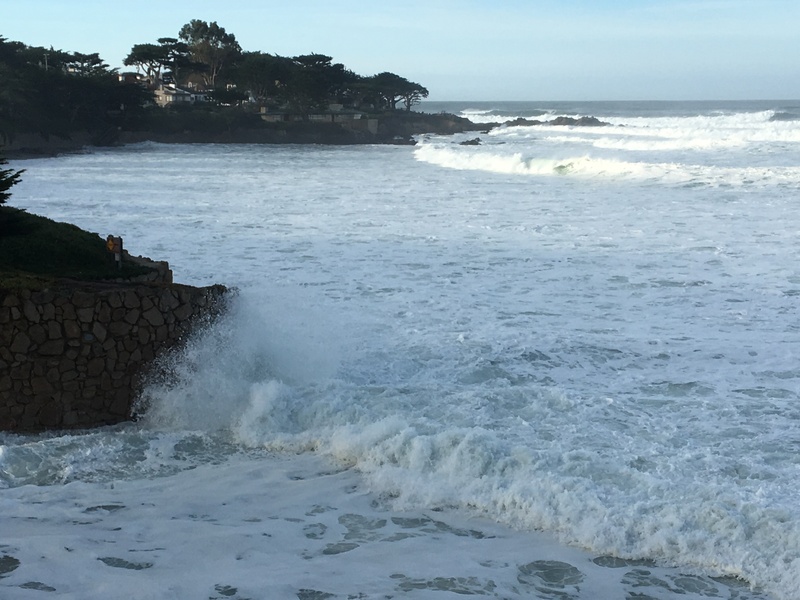 Waves test the seawalls behind what is normally the broad Carmel Beach on the morning of Friday, January 18, 2019. Significant coastal erosion is possible during events of this kind. 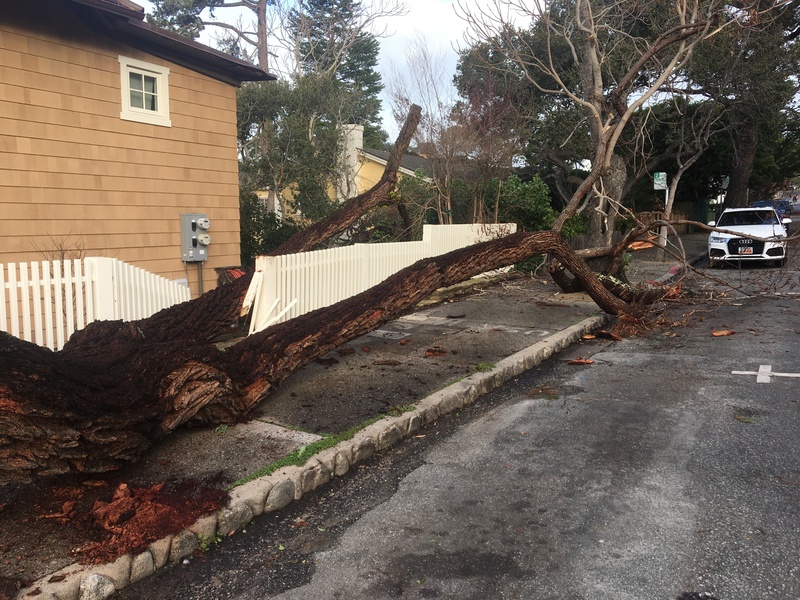 This entry was posted on Friday, January 18th, 2019 at 5:07 pm and is filed under Big Sur, Carmel River, Coastal Development/Erosion, Fire, Flood & Apocalypse, Santa Lucias, Water. You can follow any responses to this entry through the RSS 2.0 feed. You can leave a response, or trackback from your own site.